A great alternative to rice is bulgur. It’s nutty flavour goes well with meat. Especially lamb. I ate it with some Kofte in tomato sauce, just as I did in Turkey where it’s as popular as a rice pilaff. Delicious. Heat the oil in a saucepan over a moderate heat. Fry the onions for 4-5 minutes until soft the add the garlic, turmeric, cinnamon and chilli and fry for 30 seconds. Add the stock and wine, bring to the boil, reduce the heat and simmer for about 8 minutes. Rinse the bulgur wheat under a cold tap in a seive. Add this to the wine mixture, bring back to the boil and reduce the heat and simmer for 15 minutes until the stock is absorbed. Remove from heat. In a separate small frying pan, melt the butter over a moderate heat. Add the pine nuts and fry for a few minutes until golden. 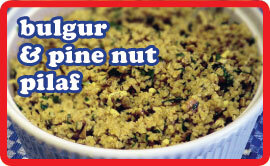 Stir the butter and pine nuts into the bulgur, along with the parsley. Season lightly with salt and pepper before serving. Serve as you would rice with a middle eastern themed meat stew. I ate it with a kofte stew and it was tasty as 10!